Navigating the Cybersecurity Storm - Advisen Ltd.Navigating the Cybersecurity Storm - Advisen Ltd.
Paul Ferrillo’s new book on cybersecurity is exactly what today’s marketplace so desperately needs: the insights of a great legal mind guided by a keen sense of the reader’s business needs. Here are the specific questions each officer and director needs to be asking. This elegantly-written treatise is a tour de force. Paul Ferrillo explains zero day attacks, threat vectors and wiperware in simple terms and then describes their potentially awesome impact on every aspect of our lives. – Peter J. Beshar, EVP & General Counsel, Marsh & McLennan Companies, Inc.
Paul Ferrillo is the lawyer crisis manager I would turn to if I had a crisis – and this book tells you why he is so widely respected where law and media risk intersect. It is a must read for lawyers and PR specialists who by now should understand that taking risks to be proactive to get your facts out usually is the best course. We are long past the point where cybersecurity can be treated like an emerging, obscure or peripheral issue. There is now a single volume guide available to help corporate directors address their organization’s cybersecurity exposures and needs. 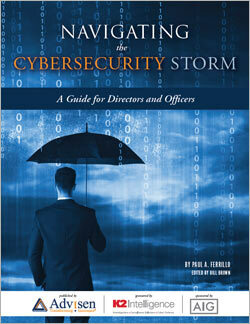 The new book by Paul Ferrillo is a readable, well-organized, and helpful guide for any corporate official seeking to address their cybersecurity responsibilities. Complete the form below to download the book. By supplying your contact information, you authorize Advisen and/or AIG and K2 Intelligence to contact you with further information. You further authorize Advisen to pass your information to AIG and K2 Intelligence for these purposes.